So without further ado, my review of one of my editor’s favorite books. Drothe is a member of a thieves guild and works as a nose--someone who seeks out and verifies whispers and rumors. When there’s talk of unrest in the city of Ten Ways, Drothe is sent out to get more information. Suddenly, he’s the target of a string of assassins with uncommon means and powerful magic. When he obtains a book filled with dangerous information, it becomes the only thing keeping him alive as important people try to get it from him and his allies abandon him. 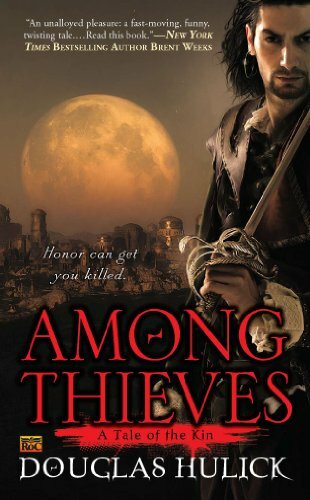 Even though Drothe is a thief and one of the ‘bad guys,’ he’s honorable and tries to do what he believes is the right thing, making it easy for the reader to root for him. I especially enjoyed his relationships with the other characters, from his sister who may have tried to kill him but is someone he can rely on when there’s nowhere else to turn, to his closest friend who is constantly saving him from trouble. Although there’s magic in this book and it takes a pretty big role in the story, there wasn’t too much of characters actually practicing and using magic, which made them more relatable. Instead, the book is filled with richly detailed sword fights and combat, placing the reader in the middle of the action. I only have the most basic knowledge of swords thanks to the Maryland Kunst des Fechtens presentation I went to, so I imagine combat enthusiasts would appreciate the amount of consideration the author poured into every altercation. My only complaint is with the pacing. The first half is more of a slow burn where the reader gradually learns about the world while inexplicable things happen to Drothe, all of which made it a little hard for me to get into the story. Then, the second half contained a ton of reveals in which multiple characters explain to Drothe what was actually going on in the first half. I can definitely see why this is a much-loved book. Anyone who likes fantasy, medieval settings, swords and sword fighting, or complex characters will enjoy reading this novel.